It is the season of goodwill but that did little to pacify Falkirk manager Peter Houston after he launched a scathing attack on referee Euan Anderson following the Boxing Day draw at Dunfermline. 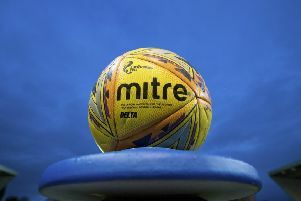 Houston accused the official of giving the Pars a huge helping hand after Bairns midfielder Tom Taiwo was penalised for handball inside the box during the second half. Rhys McCabe made no mistake from 12 yards to cancel out Myles Hippolyte’s tenth- minute opener for the Bairns. Houston said: “I thought we should have won the match, the referee gave them a bit of help. I’ve looked at it on the computer again and, from the angle he’s at, how he can tell it hit Tom Tawio on the hand, I don’t know. “When you see his angle, he is behind the player. Tom’s hand is up by his chest. He jumped up and it hit him on the chest. Is that deliberate? What’s the definition of deliberate? The Falkirk fans temporarily put aside their footballing allegiance in this derby to join their Dunfermline counterparts in a minute’s applause to mark the recent death of Pars director Margaret Ross. A steadfast fan who played her part in taking the club out of administration, Ross would have been pleased with the encouraging start made by the hosts. Dunfermline won a series of corners (they amassed a total of eight during the first period) during the opening stages. Lee Ashcroft made a nuisance of himself from the set-pieces and had a downward header back across goal cleared off the line by Scott Shepherd after ten minutes. The hosts looked most likely to break the deadlock at this stage, but Falkirk drew first blood seconds later when Hippolyte swept home a near-post effort. Left-back Tony Gallacher sped beyond John Baird and the 17-year-old kept his composure in the box to tee up Hippolyte. The second half was a closer affair and the Pars levelled in the 59th minute when McCabe sent Danny Rogers the wrong way from 12 yards after Taiwo was penalised for stopping Cardle’s cross.